The Israeli government voted on Sunday to raze a Bedouin-Palestinian village of 500 citizens to clear space for a Jewish town, prompting yet more protests against Israel’s unabated policy of settlement construction. The government ministers moved to evict residents from the Bedouin village Umm al-Hiran in accordance with the terms of the so-called “Prawer plan," which calls for the resettlement of large numbers of Bedouin villages. The Bedouins have been offered alternative sites to which to relocate, but they plan to hold protests against what they claim is “discriminatory treatment by the state,” as quoted by Haaretz, the Israeli daily. Liberal Israeli publications have harshly denounced the treatment of the Bedouins, who are being displaced by the very military that some of them proudly served. “These are Israeli citizens – citizens in a ‘democratic’ state, some of whom have even served the country militarily – who are now having their homes destroyed,” David Harris-Gershon wrote in his blog for the Tikkun Daily. The Israeli government’s reasoning for demolishing Umm al-Hiran is that the villagers never received ‘official’ zoning rights to settle the land. However, critics say Israel refused to give a stamp of approval to the village, despite ordering villagers to settle the site in 1956. In fact, Prime Minister Benjamin Netanyahu’s cabinet ministers did not meet in Jerusalem at the Knesset, as is normal procedure, to decide the fate of the Bedouins, but rather at Sde Boker, the site of Ben-Gurion’s burial place. “[Umm al-Hiran] residents are originally from the western part of the Negev; they were expelled eastward by the IDF following the 1948 war, and a kibbutz called Shoval was built on their land,” Noam Sheizaf, an independent journalist, explained in +972, a blog-based magazine. After several years of moving from site to site, the army finally told those members…to build their homes in Umm al-Hiran and Atir, and so they did in 1956, Sheizaf added. Plans to demolish the Bedouin village come as Israel continues with a policy of settlement construction in former Palestinian territories in the West Bank and elsewhere. Such an aggressive policy threatens the prospects for peace in the region, as well as the hopes for a viable Palestinian state. “The amount of settlements is huge and probably irreversible, and the signal that the Israeli government is sending to the Palestinians, to the rest of the Middle East, to the world, by continuing even aggressively to settle – it is a very negative signal, because if now the talks will not conclude in an agreement, it won’t be called a ‘peace agreement', when we will meet next time to talk with the Palestinians,” Alon Liel, former director general of Israel's Foreign Ministry, told RT. “In three or five, who knows, maybe 10 years – the volume of the settlements will be bigger, and the chance for a Palestinian state smaller,” Liel added. The Israeli cabinet’s move to displace the Bedouin community in favor of a “national-religious Jewish community” will be the subject of a Supreme Court case, scheduled to be heard next week. In 2009, the National Council for Planning and Building approved plans to build Hiran on the site of the Bedouin village. Instead of displacing the indigenous population of Bedouin, the sources said, the government should engage the community in a dialogue over an alternative to the Prawer relocation plan. Meanwhile, a group responsible for organizing a protest at the Supreme Court, the Negev Coexistence Forum for Civil Equality, called the proposed demolition plan for Umm al-Hiran a policy that promotes social inequality between Jews and Arabs, the Israeli daily reported. Racist government decisions, arrests of peaceful protestors, and a child killed in a home demolition. 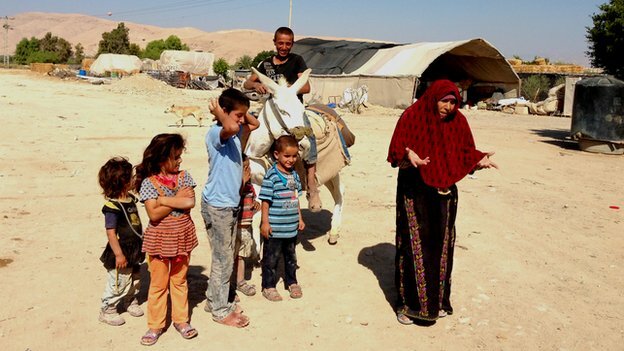 · and the legalization of the illegal settlement of Sheizaf - to be an integral part of the noose around the large Bedouin village of Bir Hadaj, to ensure that the farmers of this village will not have access to land and a livelihood. It is amazing that a government can pass such racist decisions... and the media barely thinks this is worth reporting about. And very few Israelis see it as a problem.A small group of peaceful protestors stood at the junction to Sdeh Boker. But the police decided that they do not like the message of the protestors, and decided to arrest one of us. In protesting the arrest - another two were arrested... Overhearing the conversations between the police officers I heard them coordinate their stories: "Say it was disrupting a police during duty, no, say it was... "
On Friday, a family from the unrecognized Bedouin village of Sawawin, with a demolition order on their home demolished their home on their own. Many families choose to do this in order to avoid the violence of the police entering their village and in order to avoid the hefty fines that the home owner receives when he receives the "service" of home demolition from the government. A wall that had become unstable with the demolition fell onto two playing children, killing one of them – a 10 year old boy. The second was badly hurt and is in hospital. The death of this child is a result of the harsh living conditions created by the policies of non-recognition, and by the ongoing violence of the home demolitions. And the Prawer Law of Displacement is still pursued in the Knesset. Last Wednesday was the first deliberation in the Committee of Internal Affairs. This law, when legislated, will legalize village destructions on a large scale. The three villages affected by the government decisions today will seem only a minor prologue to what we can expect. Rows of date palms stand sentinel across the vast, flat stretch of land along the border between the West Bank and Jordan. The view is dotted by dozens of Israeli settlements and Palestinian villages. This is the Jordan Valley, captured by Israel during the 1967 Six Day War, most of it now still under Israel's military and administrative control. However the fertile, largely undeveloped strip - which makes up a quarter of the West Bank - would form an integral part of a future Palestinian state if the Palestinians have their way. Israel, on the other hand, says it cannot give up the valley for reasons of security. Peace talks which resumed in August are being held in secrecy, but the fate of the valley is said to be one of the points on which Israeli and Palestinian negotiators are struggling to find a compromise. At a Palestinian family farm in Jiftlik the date harvest is just finishing. Teenagers reach up from a platform to shake the ripe fruits from each tree while their elders sort them into crates. The farm's owner, Hazaa Daragma, tells me his date production suffers because of the Israeli occupation. "The Israeli farmer has more benefits than the Palestinian farmer," he says. "He has water and resources. He gets government services and marketing. He sells his dates to Europe. 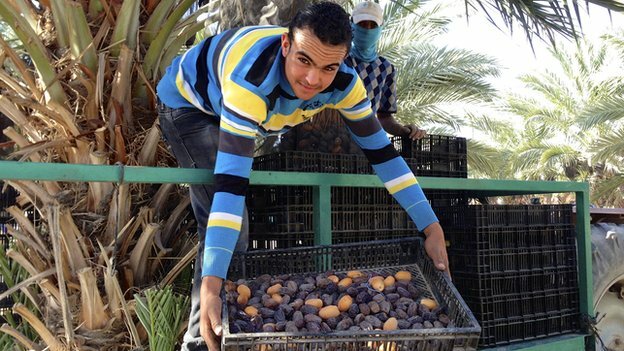 We can't export so we just get a low price in the West Bank." Israel controls all crossing points between it and West Bank, making it by-and-large not economically viable for Palestinians to directly export their produce. Many sell their produce to Israeli companies, or rely on just trading within the West Bank itself. Hazaa's father, Majid, who is in his 80s, remembers better times when he cultivated crops by the River Jordan before the land there was confiscated and turned into an Israeli military zone. "We used to have a lot of land. Now we have a small amount and they are surrounding us more and more," he says. The settlements are widely seen as a breach of international law, although Israel rejects this. The first ones in this border area were set up with national security in mind. The valley is now home to about 9,000 settlers and 56,000 Palestinians. "We are the people that the government sent to settle the Jordan Valley," says David Elhayani, who chairs a regional council, representing more than 20 settlements. "As a Jew, I tell you we can't take any risks. The Jordan Valley has to remain under Israeli sovereignty. I'm not talking about our claims from the Bible. I'm talking about safety. By staying here we protect the people in Tel Aviv and all of Israel." "Something will happen between the Arab countries and Israel, this will be the defence line." Israeli soldiers can be seen on patrol near the border, and there are signposts warning of the presence of landmines. Israeli border authorities also control Allenby Bridge, the only crossing to Jordan that can be used by Palestinians with West Bank ID. The absence of information from inside the talks has not stopped the leaders on both sides from restating their long-held positions concerning the Jordan Valley. In October, on the anniversary of the assassination of one of his predecessors, Yitzhak Rabin, the Israeli Prime Minister Benjamin Netanyahu told a Knesset meeting, "Our strength is the guarantee for our existence and peace… This requires a security border in the Jordan Valley, as Rabin said in his last speech." Previously the Palestinian President Mahmoud Abbas had addressed graduates from a new police academy in Jericho. "The eastern borders of the Palestinian state, stretching from the Dead Sea, through the Jordan Valley and the central highlands, to the borders of Bisan [Beit Shean in northern Israel] are Palestinian-Jordanian borders and will remain so," he said. The chief Palestinian negotiator, Saeb Erekat, who comes from Jericho, took foreign diplomats and reporters on a tour of the valley, stressing its economic importance. A recent report by the World Bank calculated that the Palestinian economy would be boosted by $918m (£576m) a year if it could exploit Dead Sea minerals in the southern Jordan Valley. A further $704m a year could be added if it had more access to farmland and water in parts of the West Bank fully controlled by Israel, the report said. The Jordan Valley makes up the largest single segment of what is known as Area C - Israel's zone pending a final peace agreement, as defined under the 1993 Israel-Palestinian peace accords. "In Area C, which is 60% of the West Bank, Palestinians have got to be able step-by-step to develop it," says Tony Blair, who represents the Quartet of Middle East peacemakers and has been working on aPalestinian economic initiative. 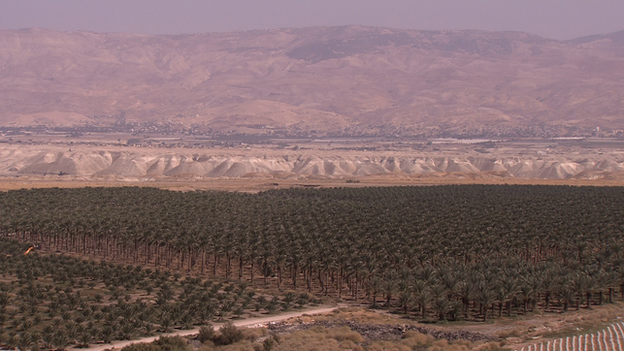 "Along the Jordan Valley you have immensely rich agricultural land. It's hard to see frankly how in the future you're going to have a Palestinian state that doesn't include that." Mr Blair has been pressing for an easing of restrictions, such as extending the opening hours of Allenby Bridge. "What we've got to try to do I think, even in advance of final agreement, is to give people on the Palestinian side a sense that the world is changing and that they can see the prospect of a genuine state opening up before them," he told me. "Likewise for the Israelis of course [we must show] that the security concerns… are going to be taken account of." In previous inconclusive peace talks, it is said a tentative deal was reached on setting up a few Israeli-manned early warning stations in the Jordan Valley. However Mr Netanyahu is now said to favour a much stronger presence even within the framework of a Palestinian state. Israeli media report that he plans to build a new security barrier in the Jordan Valley and rejects an idea favoured by his chief negotiator, Tzipi Livni, to introduce international forces to guard the border. "Our experience has been that international forces just don't do the job," says Dore Gold, president of the Jerusalem Centre for Public Affairs. He points to the limitations of Unifil, which was given responsibility for the southern Lebanon border after the 2006 war. "Israel has absolutely nothing against Palestinian economic success and there are agreements we can reach so we can share in the economic potential of this area," Mr Gold says. "But giving up the security of the Jordan Valley in a Middle East that's full of chaos? Who knows what's going to happen to Syria - maybe we'll have a new jihad stand to our east - that's a major worry for the Israeli army today." In the Jordan Valley, many residents - Israeli and Palestinian - admit to feelings of uncertainty as peace talks continue. There are regular incidents that highlight the broader struggle over the area. In September, the Israeli army demolished the Palestinian village of Khirbet al-Makhlul. Defence ministry officials say construction there was unlicensed and Israel's Supreme Court had rejected a petition against the demolition orders. However the action was internationally condemned. Human rights groups say it is almost impossible for Palestinians in the Jordan Valley to get building permits because of what they say are discriminatory practices - a charge Israel strongly denies. "When applications are rejected, this is not due to discrimination," a government official told the BBC. "Building permits are in fact granted to Palestinians in the Jordan Valley when proper requests are made... [but] The Jordan Valley is in part a security-sensitive area, since it is a border zone (with Jordan), and this makes certain areas unsuitable for private development." In the village of Abu al-Ajaj, which is still threatened with demolition, an elderly woman, Jamilla Adeis worries for the future. "The Israelis don't want us to live here. 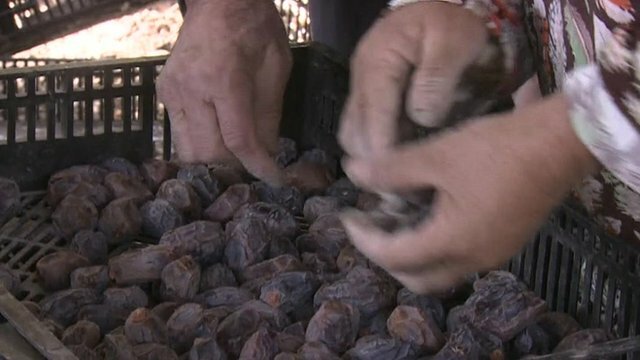 They want to kick us out and give the land to the settlers so that they can plant dates," she says gesticulating to the Massua settlement nearby. Although Palestinian labourers work in the settlements, there is an uneasy relationship between the communities. And with the murder of an Israeli settler in the Jordan Valley community of Brosh Habika last month, and the arrest of Palestinian suspects, tensions have only increased.